Our solid Brass Phillips-Head Screwdriver features a wide, textured shaft for EASY handling while the oversized top nestles in your palm. 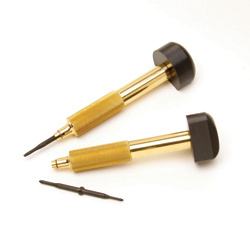 These Brass Phillip-Head Screwdrivers spin with a super-smooth gliding action to make repairs a pleasure. A lifetime replacement warranty is included with your purchase.